Roy Schondorf received his JSD from NYU School of Law in 2007, with a thesis entitled “Rethinking Some of the Basic Doctrines of International Criminal Law,” under the direction of Professor Theodor Meron, who is now president of the International Criminal Tribunal for the former Yugoslavia and the International Residual Mechanism for Criminal Tribunals. After his time at NYU Law, Schöndorf spent several years working at Debevoise & Plimpton in New York. 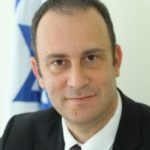 In 2010, he was asked to establish the Department of Special International Affairs, a new department in Israel’s Ministry of Justice. Schondorf also previously served as a senior legal advisor in the international law department of the Israeli Defense Forces (IDF) Military Advocate General Unit, where he played an active role in peace negotiations with Israel’s neighbors, including Syria, Jordan, and Palestine.